TREASURE CASE : 2017 T908. A complete silver book fitting of late medieval or early post-medieval date, c.AD 1400 - 1600. The fitting is formed of a flat sheet of metal (an A.5.1 clasp) with separate hinged terminal (an A.6 anchor-plate). The main plate is sub-ovate with outwardly curved sides and wide, transverse rectangular strips to either end. A narrowed curved tab extends from the centre of one end and a looped hinge extends from the opposite end. The upper surface of the plate bears incised decoration. The transverse strips have shallow borders within which are interlocking triangular cells, the central and outer of which have short transverse nicks. The curved edges of the central plate also have shallow borders within which is a single tulip-like floral design with four ovate leaves, two to either side of a long stem, topped by a three petalled flower. The hinge of the main plate retains an axis bar around which the separate terminal is fitted by two flanking hinge loops. The loops open in to a rectangular bar from which a larger pointed ovate plate extends. Two rivet holes are present to either end of the ovate plate, one of which retains a silver rivet. The terminal is also decorated with incised decoration including shallow borders. A shorter tulip-like floral design, similar to that in the main plate, is also present within the ovate plate. The reverse of the fitting is flat with a makers mark stamped in the centre of the main plate. This is possibly the letter H or numeral II. Length: 59.9mm; Width: 13.2mm; Thickness: 0.9mm; Weight: 4.9g. 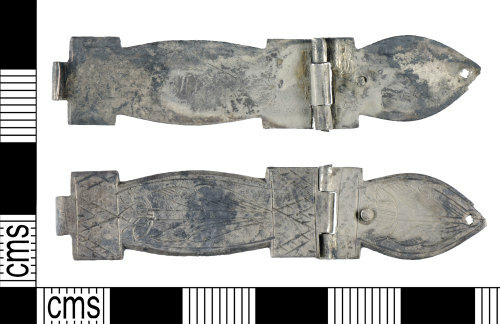 Discussion: The form and decoration of this clasp part of this book fitting is paralleled in 2010T773 (BUC-507330), 2013T938 (ESS-9C21F5) and the anchor-plate part in 2016 T748 (NMS-551569). These are dated to the late medieval or early post-medieval period. In terms of age and as the object contains a minimum of 10% precious metal it qualifies as Treasure under the stipulations of the Treasure Act 1996.